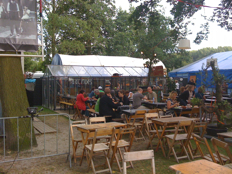 Posted by dutchgrub	on Tuesday, August 11, 2009 at 20:33. 0 Comments. Last weekend we went to De Parade to see Spinvis and have a good time with a group of friends. De Parade in Amsterdam will run for about another week until 16 August. De Parade is great fun on a nice weekend day or sunny school night. It’s best to go with a group of friends and play it by ear. Find a large table somewhere on the food court, grab some drinks and make plans. Some people will want to see shows, others will want to eat, some come and others go. Since this is a food blog, I must warn you. The food court is big and there is a good selection of food from all over the world – pizza, sushi, tapas, you name it. 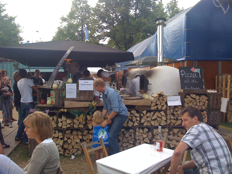 But don’t expect any good food – it’s really all about the fun and gezelligheid as the Dutch like to say. But not about good food. The teriyaki was bland, the tapas pre made and the wood oven pizza dry and with very little sauce. We had a good time anyway and never even made it to supposed Parade foodie destination restaurant De Aalmoes. As for shows, we were keen on seeing Spinvis’ show Kamermuziek and managed to get tickets without any problems. Spinvis is a well-known Dutch indie musician. His music is low-fi and played, sung and produced entirely by himself in his attic. His lyrics conceal deeper meaning behind simple, superficial situations and will make you think about life. His show Kamermuziek was great. He took us on a journey, decomposing his songs into tracks and letting us peak into the attic where he makes music. 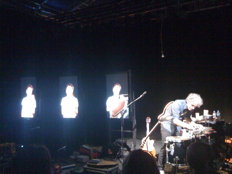 He played some sounds into a loop machine and added the major instruments on large video screens showing himself. Singing and playing the guitar he managed to make it all come together into his trademark melancholic pop songs. Although I found it slightly expensive, I would recommend a trip to De Parade. The entrance fee is € 7 and we paid € 7,50 for the 45 minute Spinvis show. Add to that plenty of food and drinks at festival prices (e.g. € 2,20 for a very small beer). The program changes throughout the week and Spinvis unfortunately won’t return. 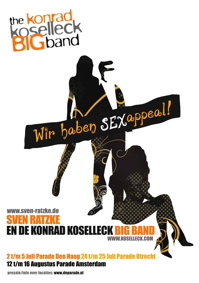 Another interesting act on the program is Sven Ratzke with the Konrad Koselleck Big Band. 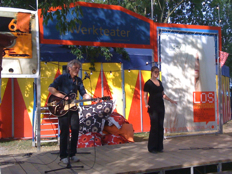 In “Wir haben Sexappeal”, German-Dutch entertainer Sven Ratzke will bring his Berlin style chansons to De Parade, supported by a 16 strong big band. Filed under amsterdam, drinks, festivals, food, fun.